Brooke and Presley came over last Thursday to play with Aleck. Initially, AJ was not so excited to share his toys, but he got better and they played really well together. 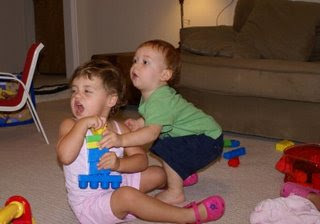 You can see in the early pictures that Aleck is trying to take legos away from Brooke and she is not happy. She finally got up and moved away from him. A couple of times, AJ would walk up and try to sit down on Brooke like she was a chair. I'm not sure what that was all about. Brooke and AJ made up after fighting over legos, and I snapped a picture of them giving each other a kiss. Brooke and AJ had so much fun putting a plastic drum on their head. It is so funny the silly little things that can entertain a toddler. 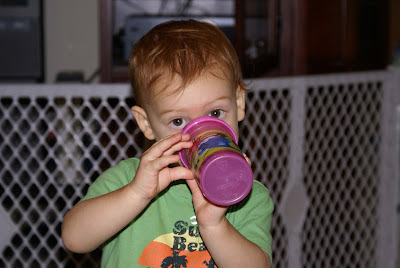 Aleck thought the water in Presley's pink sippy cup tasted much better than the water in his green sippy cup. Thanks, Brooke and Presley, for such a fun filled day. I love the pictures of the bucket. Brooke's smile says it all. She absolutely adores Aleck.